Congrats for making your first Godot game! Well considering this is your first Godot game, well done! Nothing like the pressure of a jam to push you to learn. It's simple, but it doesn't aim too high so it achieves what it need to. I think so! There was many more things that I ran out of time to add, would def like to get at least some of the ideas in there! Fun little game!! 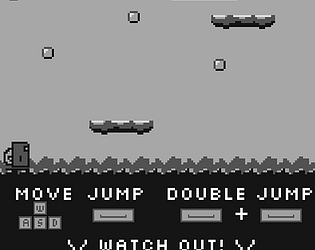 At first it was hard to get used with the jump height, but once you get the grip of it, you can go pretty fast jumping from platform to platform! I noticed, though, if you jump to off screen (far left or far right), the character will be falling forever. It shouldnt be an invisible wall or teleport to the oposite side when this happens? But I understand it was your first try learning a new engine so it was really good work!! For being a first try on Godot engine it's REALLY good. Keep it up with the good work and can't wait for the next games. Now gonna grind for getting that sweet WORLD RECORD ON MAD MUG ASCENSION!!!!!!! !